Few historical dramas are ever so specific about a subject as Eight Men Out. 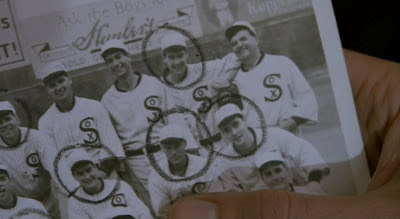 The movie’s original poster promotes the film as “The inside story of how the national pastime became a national scandal,” and indeed that’s exactly what Eight Men Out is, and not much more. Recounting the conspiracy, investigation and trial that made the 1919 Chicago White Sox go down in history as the Black Sox, Eight Men Out is less concerned with understanding why several White Sox players threw the World Series than with chronicling how it happened. Character development is scant. The movie suggests that legendary outfielder “Shoeless” Joe Jackson is dim and illiterate, that owner Charles Comiskey is a selfish tightwad and that catcher Ray Schalk will stop at nothing to win – and those are the multidimensional characters. John Sayles, working from a book by Eliot Asinof, doesn’t dive into the minds and motives of these men perhaps because he doesn’t confuse them for protagonists in a Shakespeare tragedy. After all, when professional athletes stand to make far more money by failing than by succeeding, “To cheat or not to cheat?” isn’t much of a question. The lifetime banishment from baseball of eight players who worked with gamblers to fix the World Series was designed to take that question off the table altogether. And Pete Rose notwithstanding, it seemed to work. But the Black Sox scandal only dissuaded a certain kind of cheating, and while Eight Men Out is ostensibly about a time more than 90 years ago when baseball lost its innocence, the film’s real value doesn’t come from what it tells us about the era it portrays but from what it tells us about the era in which it was made. Released in 1988, Eight Men Out hit theaters a year before the Oakland A’s mashed their way to an earthquake-delayed World Series title partly on the broad shoulders of two players, Mark McGwire and Jose Canseco, who were much smaller than they’d become but certainly bigger and stronger than their contemporaries, and who would eventually be at the epicenter of baseball’s second loss of innocence: the steroids scandal. In retrospect, Eight Men Out hovers before the 1990s like a harbinger of doom, but it wasn’t meant to be an omen. In fact, while the steroids era might have sprouted with that Oakland team (personal theory), it wouldn’t become part of the public consciousness for another decade, when a reporter noticed a bottle of androstenedione in McGwire’s locker. So it’s interesting today to watch Eight Men Out and notice the sadness it has for an impurity of another generation, knowing with the benefit of hindsight that another impurity was growing under its feet. But it’s even more interesting to consider the differences between that distant scandal and baseball’s recent one. In both cases, the “cheating”** players were motivated by money, but while the 1919 White Sox hooked up with gamblers because they weren’t being paid enough, players in the steroids era took performance enhancing drugs because player salaries are so high. If the Black Sox scandal showed the dangers of paying players too little, the steroids era revealed the dangers of paying them too much. Of course, the 1919 White Sox artificially reduced their performance in an effort to lose, whereas players in the steroids era artificially enhanced their performance in an effort to win. From a distance, the latter seems preferable to the former, because sports is defined by the pursuit of victory even more so than by fair play. Alas, the dirty little secret of the steroids era is that enhanced player performance enhanced the game itself, thus turning the institution of baseball into a coconspirator. Cheating in sports creates all sorts of winners. But the ultimate losers, each and every time, are the innocents and the trusting fans. Eight Men Out links those two groups together through third baseman Buck Weaver. Played by John Cusack with baby face and furrowed brow, Buck is the only White Sox player approached about the conspiracy who refuses to take part in it. He hits. He fields. He tries to win. And on the way home from games he engages that trusting fan base – kids in the neighborhood who hang on every pitch and adopt their favorite players’ names while playing stickball in back alleys. According to Eight Men Out, Buck is innocent, but he has baseball taken away from him anyway, because mass corruption has a way of overflowing the margins of its architecture. In the trial, Buck pleads for a chance to testify on his own behalf: “I’m being charged for a conspiracy I didn’t have nuthin’ to do with.” It’s the kind of plea that you figure clean players in the steroids era must have thought to themselves, fully aware that nothing could be gained by saying it out loud. With a cast that includes Cusack, Charlie Sheen, Christopher Lloyd and Nancy Travis, Eight Men Out has a distinct 1980s pedigree, but otherwise it’s impressively timeless. A few days ago the Miami Marlins opened a new ballpark that includes a retractable roof, a swimming pool beyond the outfield wall, two aquariums built into the backstop and a psychedelic sculpture in centerfield featuring dancing flamingos and erupting waterworks. It is what it is: a sign of the times. So it’s nice to have films like Eight Men Out that show baseball as it used to be, with backstops that look like simple backyard fences and outfield walls made of genuine billboards, with lumpy leather gloves on the fielders and bowler hats on men in the crowd. It was a simpler game back then, to be sure. Just not a more innocent one. **There’s a compelling argument to be made that players who took performance enhancing drugs (PEDs) weren’t actually cheating because Major League Baseball didn’t test for PEDs or outline the consequences of using PEDs, thus there wasn’t technically a rule against it. I'm very fond of this movie, evidently more than most; I was surprised at the tepid response when it was released (including Chicagoan Roger Ebert). Sometimes I like to categorize directors as "deep vs. wide." Sayles, at his best, isn't a deep filmmaker, like Shelton in Bull Durham; but a movie like Eight Men Out is great at covering a wide swath of the socioeconomic spectrum and the effects an event like the Black Sox scandal had on it. As you pointed out, most of the characters are one- or two-dimensional (exceptions: David Strathairn's and John Cusack's), but like a good Altman movie those dimensions all connect to one another to create a collective organism. That's how Sayles gets at the tragedy - collectively as well as individually. Also gotta give props to Studs Terkel and Sayles himself (as Ring Lardner), who play off each other beautifully as a cynical Greek chorus. "So it’s nice to have films like Eight Men Out that show baseball as it used to be, with backstops that look like simple backyard fences and outfield walls made of genuine billboards, with lumpy leather gloves on the fielders and bowler hats on men in the crowd. It was a simpler game back then, to be sure. Just not a more innocent one." Indeed Jason. I'm most assuredly a fan of this one as well, as I am of BULL DURHAM, which you have also reviewed magnificently below. Sayles' film is hugely symbolic, but as you exquisitely delineate, it has the period feel and the right textures for a film set in that long ago time. But this is no surprise, as it is a trademark of Sayles' style of filmmaking. While the wistful fantasy FIELD OF DREAMS is my favorite baseball movie, the moving BANG THE DRUM SLOWLY brings the most tears, THE BAD NEWS BEARS the most laughter, BULL DURHAM the most compelling authenticity, THE NATURAL a dreamy romanticism, and THE PRIDE OF THE YANKEES the hometown pride felt most deeply by Bronx Bomber fans, I'd say EIGHT MEN OUT brings a vital social and political element into a true understanding of the national pastime that only Ken Burns' magisterial series can equal. Sayles' film is an evocation of a sport as an integral component of a nation's fabric. As always your work here is top-drawer in every sense. Oddly enough this is probably my fave Sayles film, even over the likes of LONE STAR and others. I like the no-nonsense approach of that he takes with EIGHT MEN OUT. He presents the facts and then shows how it all plays out, which players were greedy and corrupt and which ones just wanted to play the game. But I also think that Sayles does a good job going to great lengths to show what motivated the players to do what they did. By villifying the Sox owner, you really do feel for the players. They were getting paid peanuts while he was getting filthy rich. But, as you wisely point out, it is the fans that are ultimately punished for all this by seeing their favorite players banned from the game. Craig: I think the "deep vs. wide" description works very well -- I like it. I didn't mention David Strathairn, who, yes, is comparatively deep. But in his case, and Cusack's, those guys are really just two-dimensional characters standing out next to a lot of one-dimensional guys. But, as you imply, it works for what Sayles is going for. JD: I haven't seen Lone Star since college and I need to; I have seen several Sayles pictures but somehow don't have a strong sense of what a Sayles film is. And, you're right, it is a fairly no-nonsense approach here. Sayles isn't afraid to portray the cheating players as crooked, but he make it clear that the system made them that way. I remember liking this movie but finding it rather cold. Craig brought up Ebert's review, and I sort of agree with Ebert that while we're watching the film, it's difficult to imagine how the crowd wouldn't realize that the Sox are throwing the game. It's still a good movie, but I do find Sayles' work with Liliana, The Secret of Roan Inish and Lone Star to be a tad more emotionally-involving. My favorite scene: David Straitharn pitching a bad ball, and then we cut to Sayles, in the audience, shaking his head. "You lied to me, Eddie." BTW Jason, I'm enjoying this baseball-movie series of yours. If you're looking for a really good one to review, I have a suggestion: Robert Mulligan's Fear Strikes Out (1957), starring Anthony Perkins as Jimmy Piersall. It is to baseball what Raging Bull was to boxing. To the movie's credit, at least they portray the player's cheating like it's kind of an open secret. Then again, somehow the team's competitive catcher doesn't seem to pick up on it, so I guess that reading is a bit flawed. Glad you're liking the series. I figure at some point I'll pause, just to keep from burning out on baseball movies. Fear Strikes Out is a movie I've only seen parts of, so I'll put that on my list for sure!